Centralia is Lewis County’s largest city with a population of about 16,400 people. It is located in the northern part of the county in southwestern Washington state, inland of the Pacific Ocean and west of Mount Rainier. The city is about 55 miles south of Tacoma, 85 miles south of Seattle, and 90 miles north of Portland, Oregon. 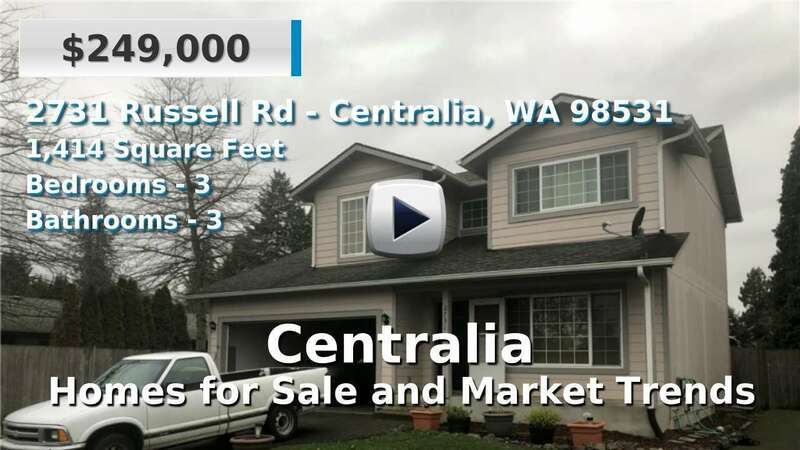 Homes for sale in Centralia are nearly all in a rural location and, in general, are a few years older than the average age of homes in Lewis County. The city has several parks, including 100-acre Fort Borst Park and Seminary Hill Natural Area, with over 2 miles of wooded trails, and also is home to the Centralia Factory Outlets, a popular shopping destination. 3 Beds | 2.5 Baths | 3351 sq. Ft.
3 Beds | 2 Baths | 1560 sq. Ft.
3 Beds | 2.5 Baths | 2168 sq. Ft.
2 Beds | 2 Baths | 1120 sq. Ft.
3 Beds | 1.75 Baths | 1602 sq. Ft.
3 Beds | 2 Baths | 1833 sq. Ft.
3 Beds | 1.75 Baths | 1386 sq. Ft.
4 Beds | 1.75 Baths | 1758 sq. Ft.
3 Beds | 2.25 Baths | 2645 sq. Ft.